Rehabilitation plays a predominant aspect in the improvement of medical health of an individual. To ensure an independent lifestyle back to the patient, our physiotherapeutic services extend top of the line expertise backed by world class facilities that aid in the overall recovery of our patients. 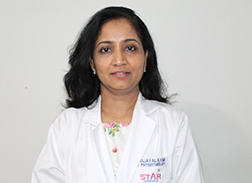 The department of physiotherapy at STAR is widely acclaimed for its superior expertise, excelling in diagnosis and individualized therapeutic planning rendering extensive care on the basis of both in-patient and out-patient. With technologically advanced physiotherapeutic equipment, the dedication of our experienced physiotherapists has rehabilitated many of our patients with comfort and ease back into their lifestyles. Patients who have undergone complex cardiac procedures such as bypass, valve replacement or such other advance procedures seek the assistance of physiotherapy to ensure appropriate cardiac rehabilitation, so they can be assured of a healthy and comfortable lifestyle along with reduced risk of any cardiac complications in the future. Our department of physiotherapy also works closely with the department of neurological sciences and the department of joint replacements, thus ensuring enhanced reach of the physiotherapeutic services to a number of patients and rehabilitating a majority back into better lifestyle and in an improved health condition. Advanced Cardiac procedures such as valve replacements, bypass surgeries, heart transplantations and many such.